What can you unlock with the power of talk? Find out how increasing academic oral language can improve overall academic success. Oral language is the foundation of all subsequent learning. However, we rarely teach it systematically in school. We all know that children learn to speak before learning to read and write. But we often forget that speaking can facilitate learning in other areas. “Speech--talk--is the representation of thinking. As such, it seems reasonable to suggest that classrooms should be filled with talk, given that we want them filled with thinking!” (Fisher, Frey & Rothernberg). This is also true in the real world. In a 2016 article in Business News Daily, Linkedln researchers found that Good Communication is the number one most in-demand soft skill. "Hard skills vary based on the job, but soft skills are required for every job. That makes soft skills extremely valuable." Guy Berger, an economist at LinkedIn. However, in classrooms across America, most of the talking is still done by the teacher. Some studies show that up to 90% of the talk in a classroom is done by teachers. Napa Valley Unified School District shadowed English Language learners to determine how much talking was going on in our classrooms. 60% of the academic talking is done by the teachers. 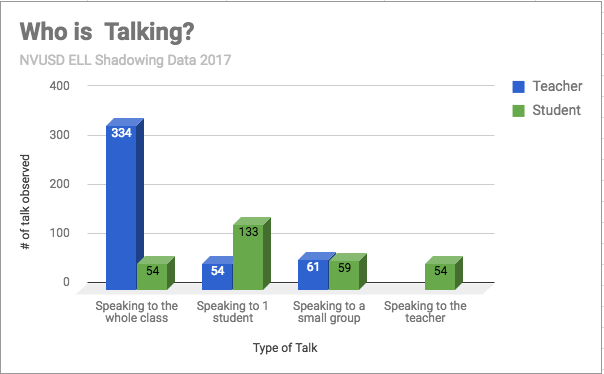 17% of the academic talk is done by students talking to other students. Students are using academic talk to respond to the teacher 7% of the time. If we want our student to excel academically and in the real world, we need to increase student talk and the quality of academic communication. Oral language is so important, is appears repeatedly in the Common Core Standards. 694. These words appear 694 times in the standards. 404 times in ELA. 290 times in math. See the graph below to see a breakdown of where these words appear the most. 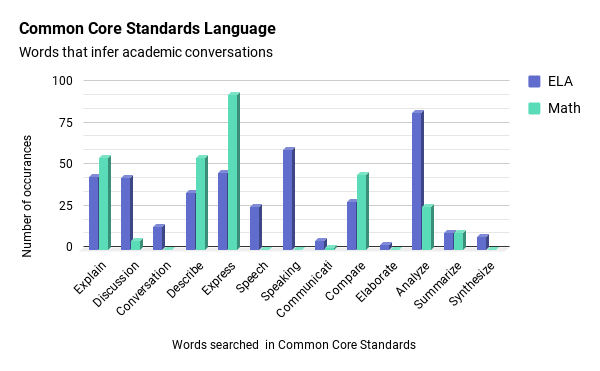 The graph below shows how many "conversation" words occurred in a simple search of the Common Core Standards. For more info on Common Core Standards go to the standards tab above. Click on the image above to watch a 90 second video.